Our Inground Pools eBook focuses on providing potential buyers with all the information necessary to make an informed decision regarding purchasing an inground pool. In addition to the eBook, we create a landing page that includes a contact form that will allow customer information to be managed within your CRM. The eBook is then emailed to the customer to download and followed up with five additional automated emails that will guide them through the sales process, ultimately converting those leads into new pool construction sales. Our Inground Pools Marketing Workflow is an effective lead nurturing tool that captures contact information of qualified leads so they can be tracked within your CRM. Lead nurturing campaigns help build relationships with prospects and customers as an automated way of keeping your leads engaged with you and your brand while sharing content with them that they will see as valuable. 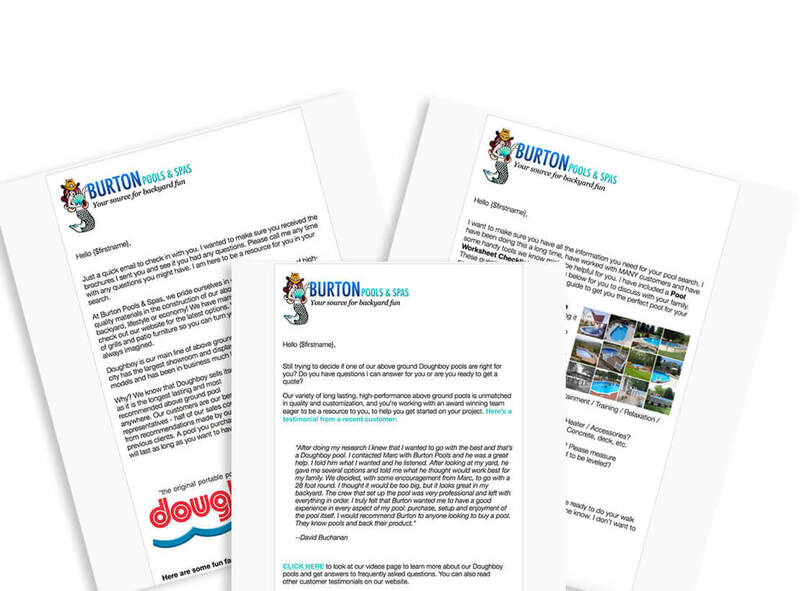 The drip emails are an effective marketing tool used to provide your customers with additional information about the inground pool construction services you offer and they are interested in, as well as to gain more personal information about your company. These professionally written drip emails are intended to nurture the lead through the sales funnel while assisting your sales team with ultimately converting the lead. The emails are strategically delivered to the lead’s inbox on a pre-determined schedule to ensure the information is provided at exactly the right moment, keeping them interested in your services without overwhelming their inbox. Nuture Leads. Guide prospective buyers through the early stages of the sales funnel through automatic drip campaigns. Capture More Leads. Capture qualified leads automatically and turn your visitors into buying customers. Be Relevant. Deliver the right information at exactly the right moment. Our Inground Pools Marketing Workflow works best for any pool construction company owners needing to automate their marketing and sales process to get more new pool construction leads.